This deluxe book showcases the unique costumes of the Star Trek saga, taking in fifty years of iconic and hugely influential designs. Drawing on the entire franchise, including all twelve films and six TV series, Star Trek: Costumes explores the creation of some of the most memorable garb in the galaxy, telling the complete story of how Star Trek's outlandishly chic wardrobe has been expanded in increasingly thrilling ways throughout the years. From the classic Starfleet uniforms and daringly provocative outfits of The Original Series to flowing Vulcan robes, flamboyant Ferengi fashions, and formidable Klingon wedding attire, Star Trek: Costumes explores how these designs have played a key role in transporting fans to distant worlds and alien cultures over the last five decades. Filled with exclusive photography, stills from the saga, rare concept art, and other striking visuals, Star Trek: Costumes also focuses on the talented individuals who have brought the Star Trek universe to life, including original costume designer William Ware Theiss and his successors, Robert Fletcher, Robert Blackman, and, most recently, Michael Kaplan. 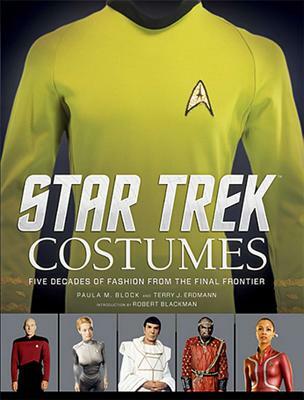 Featuring extensive information on the creation of each featured costume, with insight and anecdotes from interviewees including Blackman, Kaplan, J.J. Abrams, LeVar Burton, Jonathan Frakes, and Ronald D. Moore, this book is a comprehensive and captivating celebration of the incredible artistry that has made Star Trek's costumes as innovative and imaginative as its futuristic technologies. Also featuring an introduction by Robert Blackman, Star Trek: Costumes is the ultimate way to experience the incredible fashions of the Final Frontier. TM & (c) 2015 CBS Studios Inc. (c) 2015 Paramount Pictures Corp. STAR TREK and related marks and logos are trademarks of CBS Studios Inc. All Rights Reserved. Paula M. Block is the co-author of the novella Star Trek: Deep Space Nine -- Lust's Latinum Lost and numerous nonfiction books about the entertainment industry, including Star Trek The Original Series 365, Star Trek 101, Monk: The Official Episode Guide, The 4400 Companion, Star Trek: Deep Space Nine Companion, The Secrets of Star Trek Insurrection, Star Trek: Action!, and The Magic of Tribbles. She is also the co-editor of Pocket Books' popular short story series Star Trek: Strange New Worlds. She has been a columnist for the Chicago Sun-Times, the Midwest correspondent for Biotechnology Newswatch, and the international editor for Chemical Week. After 19 years overseeing and editing licensed publishing for Paramount Pictures and CBS Television, Paula moved to Southern Oregon, where she and her husband, author Terry J. Erdmann, write a monthly entertainment column for The Jacksonville Review.